Since 1969, the North Texas community has partnered with us to save lives. Thank you for joining us as we continue our challenging work in suicide prevention. Please let us know if you would like your donation to be anonymous. 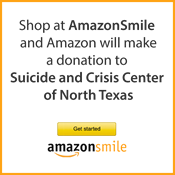 All contributions to the Suicide and Crisis Center of North Texas will be acknowledged and are tax deductible.